What was everyone's issue with this book? Before diving into it, I had seen people on Twitter and Goodreads complaining that it was just a pale comparison of The Wrath and the Dawn by Renee Ahdieh, that it was too similar but not nearly as good. Is that so? I didn't find it so at all. 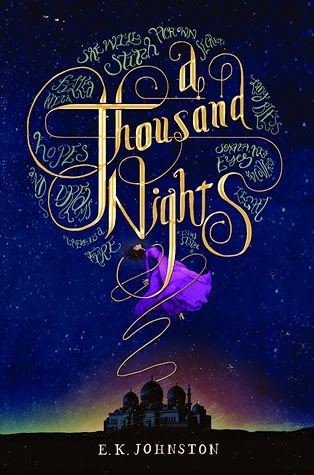 A Thousand Nights and The Wrath and the Dawn are both retellings of One Thousand and One Nights, and they are both published in the same year, but they are vastly different. This review isn't meant to be a comparison of the two! It's just that so many other reviewers have been complaining of the similarities, and I want to hopefully dispel that notion! We have a nameless heroine! In fact, the only person who has a name in this book is Lo-Melkhiin. There is "Lo-Melkhiin's mother", "wife", "my sister", "my father", etc. I thought this was interesting, and I didn't realize that not even the heroine was unnamed, until the very end of the book. Rarely do you come across books that feature a nameless protagonist! Our heroine is never afraid of Lo-Melkhiin, because she knows that he could kill her at any time. She goes about her day trying to stay busy with spinning wool, the only thing she is allowed to do. She starts to notice visions, snippets of the future, especially when she is spinning. Her sister, back in the desert, has been praying to her "smallgod", and our protagonist has power. She is strong and unafraid, steadfast and courageous. She is also clever and selfless, and tries to help the others in the palace. Lo-Melkhiin is another matter. He is not who he appears to be, just like Khalid in The Wrath and the Dawn. Except he is very different. Lo-Melkhiin is having girls killed after marrying them, but his reasons are very different, and not entirely noble. You have to read this one to understand - I feel so bad for Lo-Melkhiin! Yet he is doing every cruel thing we know he is doing. One of the biggest differences between this book and The Wrath and the Dawn is that this book features no romance. This book is not full of swoons. However, a bit of a romance has potential, with our protagonist. This is a standalone and should remain so, but the ending leads me to believe in a romance. It is sweet! This book has a darker tone than The Wrath and the Dawn, in my opinion. I rather like this. The protagonist is less known to us, and it's not just because she has no name. She seems very universal. Her love for her sister and family is constant, never changing. Everything she does is for her sister. And Lo-Melkhiin uses this against her. The protagonist does not fear Lo-Melkhiin, but she should. There are some tense moments between him and her, and they scared ME. So the story is darker, less hopeful, less swoony. None of these things bothered me. I didn't expect a swoony tale from this one, not from the beginning. There are two perspectives; third person, which is our female protagonist, and first person, which is our male protagonist (who is also technically the villain). So you know exactly what is going on in his head. He is definitely as she describes him - a lion, and a viper. There is much more magic at work in this story, and the story is more dependent on it. I loved this! Our female protagonist has magic, as well as Lo-Melkhiin, and even the sister plays a role in the magic. The magic is so important for the protagonist, especially in terms of the visions. The setting is so well-crafted! The protagonist is from the desert, and the palace is so different. Her new life is more luxurious and pampered, yet she longs for the desert. The author describes so many stories from the protagonist's life, and while some of them were a bit boring, all of them were rich in detail and meaning. Overall, I actually really liked this book. It ended really well, and the ending was probably one of my favorite parts of this book. But I enjoyed this book for what it was, and it was NOT a swoony romance. It shouldn't be compared to The Wrath and the Dawn, because it is so different. I kind of wanted to see an epilogue! It would have made my opinion on one specific thing so much nicer. I loved the ending, but I really like epilogues, to see how the characters are doing. There is kind of an epilogue, but it wasn't the one I was looking for. Really, I didn't have too many complaints. Forgot about The Wrath and the Dawn for ten seconds, stop expecting swoon, and you will like this book. It's totally unfair that this one is falling to the wayside because everyone thinks it's a shadow of The Wrath and the Dawn! Any fantasy fan can enjoy this one. I know it's not for everyone, and people will still be mad because they want it to be like The Wrath and the Dawn in certain (swoony) ways, but I don't think that's fair at all! 3.5 stars -> rounded up to 4 stars. I'm not saying this is my favorite One Thousand and One Nights retelling, but I AM saying that it is an interesting. Totally different spin on the original, and very intriguing! I'm glad I gave this book a chance. I kept looking at this book on net galley, but then I kept requesting other things instead, but this book sounds really good and you make it sound even better so I think I'll have to check this one out when it comes out! I was getting annoyed with all the comparisons to The Wrath and the Dawn, especially one that said that it was a copy cat of it which is a ridiculous notion because a) they are both retellings of the same original story and b) they are being published in the same year which means they were probably also sold to the publishers at the same time. Right?! I didn't it find it similar at all (except that they are both retellings). The similarities end there. (And pub year, but that is out of each other's control). Interesting! I've seen the comparisons but figure I'll be reading it eventually. I loved Wrath and the Dawn but I do think there is room for another adaptation. I sort of wish there was a romance? Haha, I like just a touch but I'm still very curious about this one. I loved them both, so definitely room for more! I half wanted more romance, half glad there wasn't. People comparing the books would have had a field day, had there been more romance. "A Thousand Nights is the same as The Wrath and the Dawn", "she copied", blah blah blah. I have an eARC of this and I'm excited to read it soon! :) I'm glad I came across your review! I hope you LOVE this one, Julia! Happy reading! Poor book to have the misfortune to release at the same time as a similar one. I don't mind that you did the comparison and explained. I have not read a 1001 Nights tale since the original so I'm intrigued. Thanks for sharing about it! I finished this one last week and I feel just like you. It's unfair to compare booth books as they are very different, I actually didn't found this one to be a re-telling of 1000 nights. It was weird but very interesting still. I did hope for an epilogue or a better ending though. I don't understand why they keep comparing The Wrath And The Dawn. 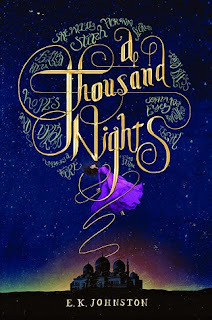 It was probably a bad idea to have two One Thousand and One Nights retellings release in the same year because of this. I'm not sure if I want to give this a try because I want to see some romance. But it's nice to see someone enjoy this one. Your review is the first one I see to not give it a low rating. Also that cover is so pretty!! Seriously though, about the comparisons! But unfortunately, these are two different authors and two different publishers, so no one has control over the publication dates. I'm glad mine was a positive one, honestly! Thank you for stopping by, Karina! I'm glad that this one was good to enjoy in its own way! And a book without romance sounds like something I'd like to try for sure! Thank you for your review! I haven't read Wrath yet, but I'm not surprised that people have been comparing them. Glad to hear they are completely different. I'm sad there's not actually any romance, but the story sounds reeeeally interesting. Will be reading this one soon. Oh! Somehow I had a feeling you hadn't. :D I hope you enjoy this book when you read it, Danielle! Thank you, Carina! Maybe that's a good thing, that you have not read either. You're very welcome!